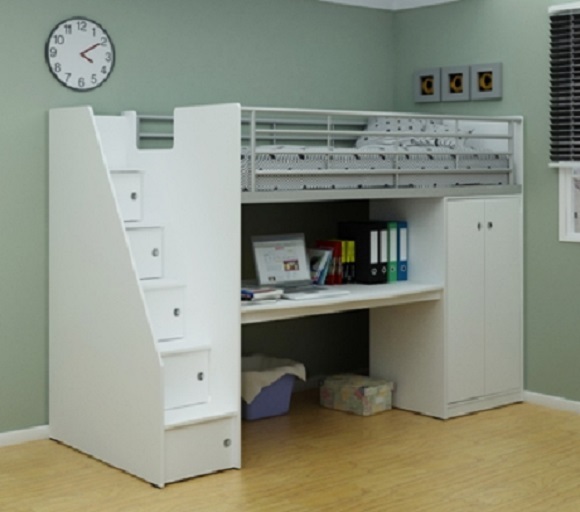 This cabin bed offers a practical room setting and optimises on space with a built in wardrobe, desk and cupboards. This is a very defined style it is a complimentary addition to any bedroom comprising of any furniture. The wardrobe features a hanging rail and the desk has space for a computer or laptop with generous room underneath for leg space or additional storage This cabin bed is constructed f top quality melamine which is easily wipe able but not damaging to the materiel with a metal sub frame for extra reinforcement and stability. The solid wooden slats that offer great support to the back and safety rails for the bed to ensure safety when your child is in bed. This cabin bed comes with full easy to read assembly instructions. Please note that the mattress cannot exceed 18cm in depth. THIS ITEM COMES FLATPACK AND THE MATTRESS IS NOT INCLUDED. IF YOU ARE NOT FAMILIAR WITH FLATPACK FURNITURE WE ADVISE YOU SEEK PROFESSIONAL HELP. THIS ITEM NEEDS TWO PEOPLE TO ASSEMBLE.